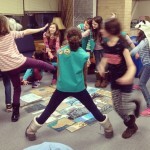 Fun times with the Girl Scouts at Whittier School in Oak Park! What an honor to assist with this creative group on earning their Art Badge! ….And what better way to celebrate the efforts then by dancing around the art pile! For more information of customizing youth art workshops for your group, please contact Right-Brained Studio!